Deep-clean your capsule machine and remove all coffee residues and bacteria in the group in just 2 mins with this pack of 8 SOLUTE cleaning capsules. 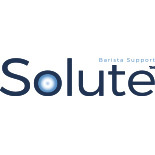 Solute offers you the best products for cleaning, maintaining and protecting all types of coffee machines (automatic, manual, capsule, filter...) All Solute products meet European standards and are assessed regularly by several testing institutes. Solute ensure that quality, confidence and customer satisfaction are their core business values.